I speak as if I’ve built it already, crashed it, and am in the process of rebuilding it. Sadly enough, this is not the case. With CPW activities in full swing, I’m pushing the fleet around all over the place for demos to prefrosh. 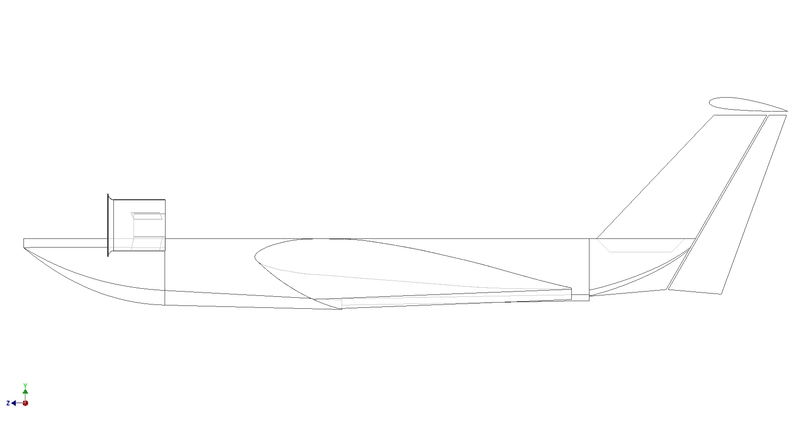 In the mean time, I’ve been slowly planning out the advent of Chuckranoplan 0004, which will be my first attempt at building a large model. I’ve been skulking around the rcgroups forums extensively looking at other peoples’ builds (sadly, not many of GEVs, but the ones that have been built are pretty awesome). I also purchased a copy of the WhizzyWIG build plans, which I have found to be less than helpful since they’re geared towards advanced modelers. It amounts to me handing someone random a 3-view technical drawing and telling them to “make it” – it presumes a certain amount of knowledge about the subject which, if present, would greatly aid the “making” process, but otherwise would probably cause more confusion than anything. At least it’s a massive print, so I can hang it on my wall as a poster and occasionally stare at it to sanity-check my own design. 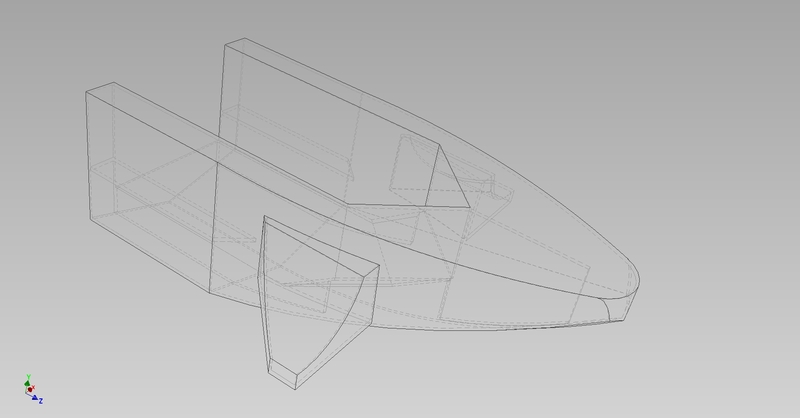 Here’s the preliminary solid geometry study for Chuckranoplan 0004. Unlike all my previous “builds”, 0004 will have a more conventional hydroplane hull. I’ve sort of gathered that hull steps are most effective if they are placed at the center of gravity and at the stern. 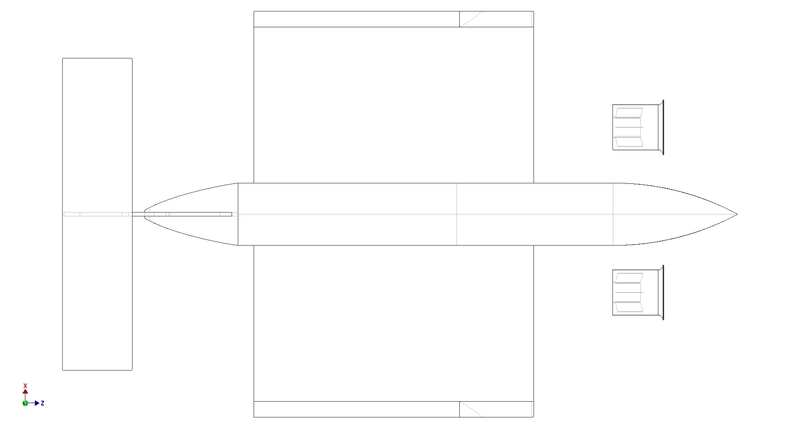 I’m not even sure if on a craft this small the steps even matter, but what they allow me to do is conveniently divide the hull into four major sections – the nose, the forward hull, the aft hull, and the stern section. Being steps, I am able to take advantage of them as dividing planes for fabricating the four parts separately. 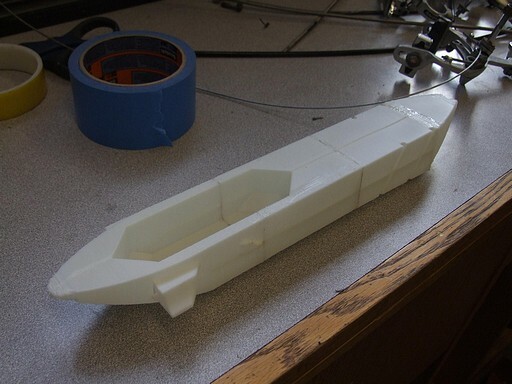 Right now the plan is to use the cross sections at the forward and aft hull to cut those two parts out of foam (probably expanded polystyrene from Home Depot), and then hollow-shell 3d-print the bow and stern sections. The reason I’m still even thinking of 3DP is that I can thin-shell those two parts, which are of substantially more complicated geometry and need to contain mounting points anyway, and not impact the weight substantially. Essentially, I hope to use the 3DP only in situations where it is actually advantageous, like the aforementioned complex integrated geometry. Looks pretty conventional (and empty). The main wings will have their profile hotwire-cut from foam. The tailplane, however, will be purchased “stock”. As it turns out, you can just straight up buy pre-cut airfoil stock made of polystyrene or polypropylene foam (EPS and EPP). What. Why didn’t I know this before? Well, they didn’t have the profiles I wanted in HOLY CRAP THAT’S HUGE, but the tailplane is more conventional. It will be a 20 inch chunk of their NACA 2415 x 4.5″ chord in EPP material. 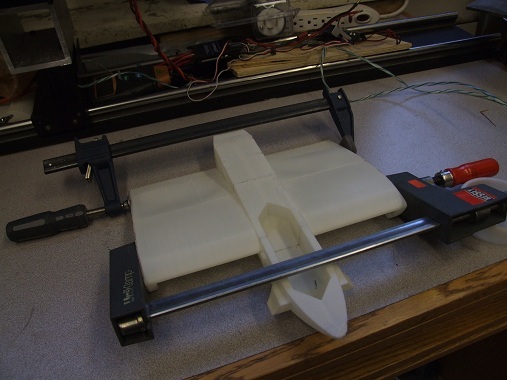 The vertical portion of the T tail will be a single plane of 1/4″ balsa wood, laser-cut to shape. 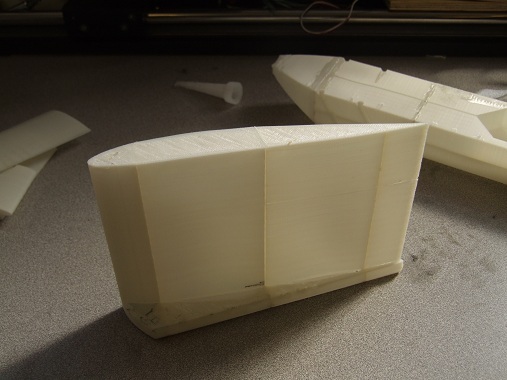 The rudder surface will hang off the back with hinge pins, and will just be another chunk of balsa sanded to a taper. The other control surfaces will just be cut-out portions of the same airfoil they’re part of, also attached with hinge pins. I have yet to arrange mounting points for any servos or controllers, and I’ll probably just take the standard R/C modeler approach of carving cavities into the foam to stuff these things in. I have also yet to design the ducted fan mounts, which will be servo-actuated so they can pivot the fans for pressure augmentation or forward cruise. The servos will probably be a handful of <20 gram park flyer servos, since while this thing is pretty big, I like the idea of having a flock of little servos instead of several large ones and long routed pushrods or cables. And a 3/4 back view. The large side pontoons will also be profile-cut and then have the end chamfer sanded to shape. As far as foam models go, I think this is actually pretty straightforward, and someone who’s done it before can probably bang it out in 5 minutes. It will be an interesting learning experience, which is mostly what I’m after. If it does The Thing, then all the better because I have an excuse to build one 10 times bigger. If I make everything in that picture from 1.0lb/ft³ foam (which seems to be a median value for XPS foam), the weight is 380 grams. I’m likely to run a 4S, 3.0Ah to 5.0Ah battery, which seems to weigh between 300 to 550 grams. I’ll toss in 200 grams, a very liberal estimate, for the weight of control electronics, servos, pushrods and actuators, glue, random hardware, and dust from the floor. That totals out to about 1.4 kg, or 3.1 pounds, or exactly where I think I should be. I’m going to throw it down right now: the next Chuckranoplan will be a 100 meter model, like the KM here. Oh, did I say meters? My bad, I actually meat 100 centimeters. Or rather, in the 36 to 42 inch range. I’ve come to the dejecting realization that air molecules, in fact, do not scale. At the ~10 wingspan inch scale I’m working with right now, it requires a level of construction delicacy that I can’t quite fathom. Moving to a much bigger model allows a great increase in the wing area, and a few grams here and there won’t matter as much. It will also force me to work outside my 3d printing work envelope, so I’m not just sitting there watching the thing be made. I can finally use real parts. If you haven’t figured it out, that’s me saying that 0003b is still too damned heavy. However, I’m inclined to believe that this round of “too heavy” is in fact caused by my choice of power system, which as i have been informed is for something like 3 or 4 times bigger. What it boils down to is that most little models like this weigh less than my battery. That’s what you get when you have a background in things made of solid metal and carrying as much battery as you can shove on it. I left 0003b in mid-construction before taking off to Monaco, so here’s what happened after I dropped everything back off in MITERS. The advantage of using these edge-slots to mount the tail is that I could glue down the center portion and verify everything before throwing the outer tailplanes on. This helped prevent another drag chute situation like last time. I just fixed one corner with CA glue, then fiddled with the angle and pitch until it looked right. And here’s the base model completed, with a single Nut of Center of Gravity Shifting. I’ve added Kapton tape around the tail rods for extra style points. This model by itself weighs 4.2 ounces. Kind of chubby, but becoming more acceptable. It actually glided fairly well alone, staying aloft after a strong pitch for about 15 to 20 feet down the hallway. With the NOCOGS installed, there was no pitch-up tendency… well, unless I accidentally threw it up in the air. Then it immediately rolled over, lacking any real vertical or dihedral surface. And here it is with the 30mm mini electric derpy fans installed. Anyways, here’s where it went totally wrong. The power system doubled the weight of the thing to a full 8 ounces. Now it was just kind of sad and hopeless. 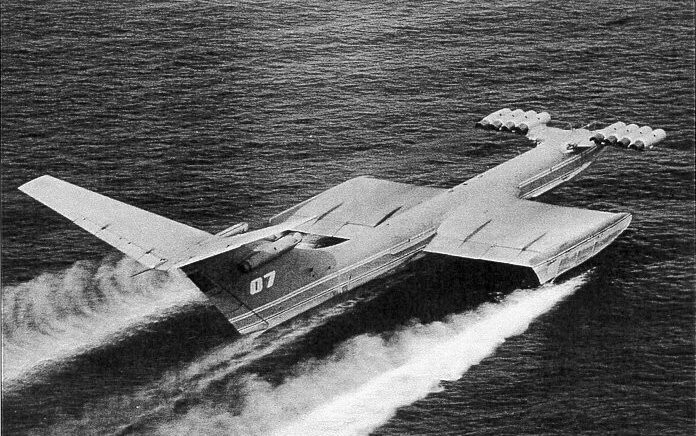 While it would get about 10 feet on its own thrust, it would quickly start veering in a circle due to ground contact. It didn’t really help if I gave it a head start by pitching it – the wimpy fans couldn’t hold up the weight of the thing after a few feet anyway. Time to do it for real. 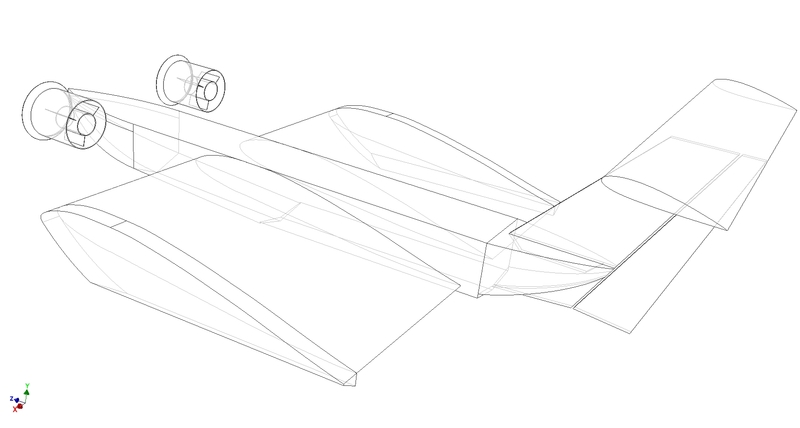 The plan is to move straight to a 1 to 1.5 meter model (yet to be CADed or materialized in any form other than scribbles in a notebook) that follows roughly the same wing geometry. The construction will be fairly standard foam cuts, with areas letting me take advantage of the better manufacturing facilities I currently have available, such as laser cut bulkheads and stringers and the like. Difficult geometries such as areas of multiple curvature (like the nose and tail) are areas where the 3d printer really shines, so the extremities will still be thin-shell printed. Because the thrusters will still be up in the nose area, it will be easy to integrate the motor mounts into the nose just like I have done now. I’ll probably also whip up my own mounting brackets. The thrusters themselves will finally let me get back into power levels I’m more familiar with. I’ve currently spec’d out these 70mm EDF units from Hobbyking, but just in case, I have this miniature 250hp bus motor also spec’d for dramatic overcompensation. Oh, yeah, it’s going to have control surfaces! I think I’m comfortable enough with model aircraft construction that now I’m going to try to integrate a rudder and flaps into the thing. No elevators yet, since hopefully this thing will stay within h/c < 0.1. I’ll probably use a garden variety park flyer servo for each, in order to keep the weight down. The anticipated weight of the entire thing is about 50 oz or less. This is actually very difficult for me to fathom. How the hell does something which barely fits on my desk weigh as much as my beetleweight? The materials and construction methods used for aeromodelling is below what my mental finite element analysis can handle. I’m going to have to get used to it. Finally, using all those model airplane things for their intended purpose. So the past 48 hours has been kind of awesome. I threw RazEr rEVolution in a suitcase and blasted off from Boston (to no incident, surprisingly enough) and landed in Zürich several hours later. After discovering that Google just senses your location and assumes you speak the local language, I continued on to Nice (which is really nice), hopped on a bus, and ended up in Monaco. That Monaco. James Bond Monaco. I’ll say right away that the places looks exactly like it does on postcards. Also, that’s the first time I’ve legitimately used a ü. About 12 hours later, the MIT Scooter Party gave a presentation to a collection of academic types at EVER Monaco 2011 about… well, scooters. More specifically, on the design and construction of the hub motors that we keep building nonstop. The nature of our presentation was very much different from the general atmosphere, which as expected of a conference, is rather academic and stuffy. Generally speaking, presenters don’t have hardware, and especially not with them. They especially don’t ride around on them while on stage. I believe the presentation was well-delivered and very well received. Afterwards, scooter testing on the Cote d’Azur! The rest of the time so far has been filled with wandering around the exhibition that is taking place at the same time as the conference. It’s primarily small, bubbly electric cars that I can’t stand the thought of driving. I’m led to believe most of them are physically incapable of doing burnouts, which I find distressing. Otherwise, electric bicycles abound, and also (full size) electric motor scooters. Usually I’d make a long post with pictures and snarky captions, but since I’ve already done so elsewhere, I’ll refrain from redundancy and just make you look through this failbook album. The remaining time will probably be spent drifting in and out of other presentations and probably checking the scene in Monaco before the Sunday afternoon departure. I can’t get away from this thing, even across the Atlantic ocean. No, I didn’t bring it with me, but I spent some time before leaving to treat MaB’s Z-axis Parkinsons and try the wing again. I strongly believed that the uneven layer thicknesses resulting from the Z axis being inconsistent was causing the prints to fail due to the extremely disparate thermal expansion stress between those layers. The fix was applying a little plastic spring clamp to the leadscrew around the Z-axis tower. The clamp added just enough friction to stop the drifting, but didn’t bind the motor so it could still step properly. I printed the right wing in front and rear halves. Finally, two prints that turn out the same height with no layer bunching. The halves were cemented together with Goop. 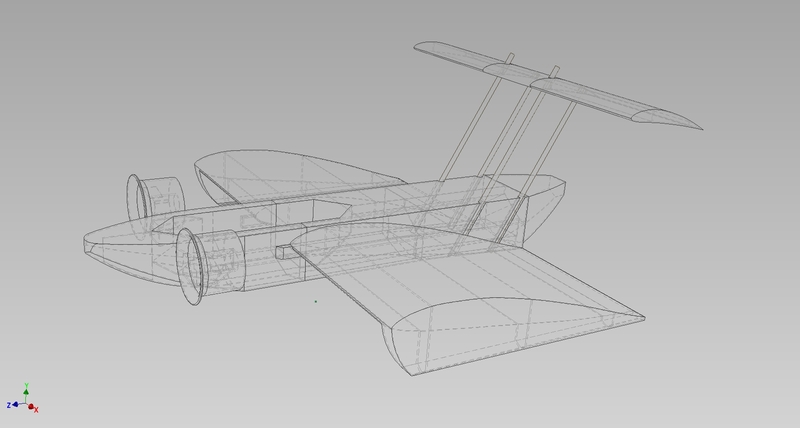 I took the remaining time to pop out the left wing, also in front and rear halves. Here is 0003B in the adhering jig. I again elected to use a film of Goop to secure the wings to the hull. Actually, for EVER. See what I did there? The story of this one is that a few months ago, the MIT Scooter Party (all… three? of us) wrote a technical paper on how amazingly badass our collective scooterness is, and submitted it to the Electric Vehicles and Renewable Energies conference that is held in Monaco every two years. By some seemingly stochastic alignment of the universe, we were admitted to the conference. So now we’re bringing the party to Europe. I swear, I’m going to run that F1 track-equivalent at least once on RazEr rEVolution. This trip would make RazEr my most well-traveled vehicle, since it also went to Singapore. As a microscooter, I guess it has an affinity for microstates. I wonder if I can sell a few to Sealand. Anyways, that’s tomorrow through Sunday. For now, Chuckranoplan! Here’s MaB executing the best one-wall print I’ve seen it do yet. 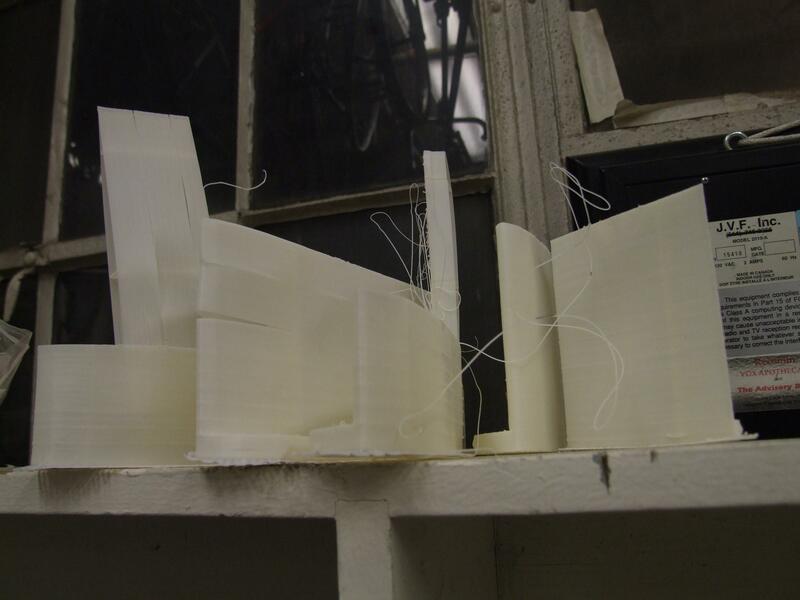 It’s printing the front end of 0003B as detailed last time. The walls are 0.5-0.6mm thick, and the internal spine is 1mm thick to allow for two passes. I was surprised at how well the Dual Integrated Bus Motor Mounts came out here. Next I dropped the two middle segments on. I placed these two parts next to eachother such that their bottoms (keels?) were almost touching. That “encouraged” Skeinforge to make the layer changes and jumps at that point, and I must say it worked very well. After all four segments were printed, I Dynamically Averaged (read: belt-sanded) smooth the interfaces and put them together with a CA glue initial bond, then Goop seal over that. The weight of this assembly is about 1.5 ounces. A look down the tunnel of the hull before I closed it off. Having the ribs there prevented this piece from distorting and buckling all over the place quite well. 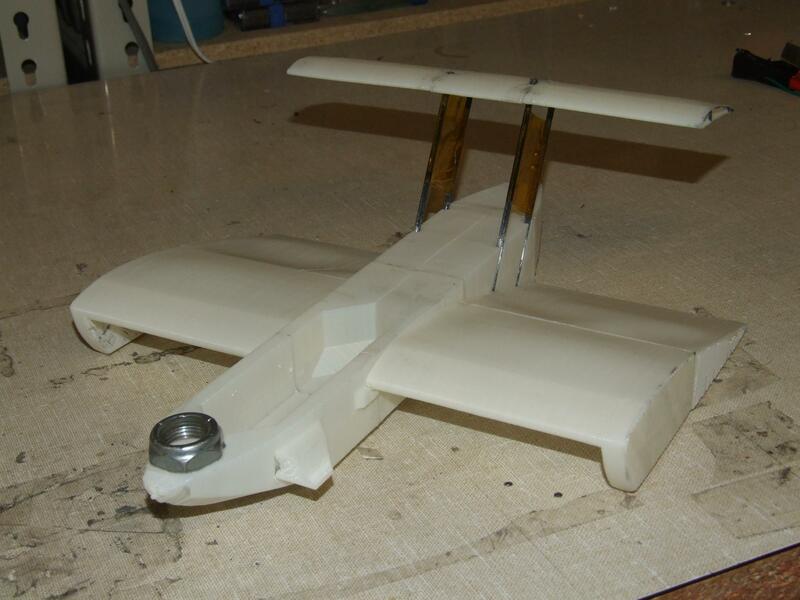 I split the tailplane into 3 parts and arranged them with the trailing edges close together. This view also shows the extra material inside to prevent warping. The next effort was to print off the new wing design. This, unfortunately, turned out to be quite an exercise in futility for reasons which will be detailed. I’m not sure if it was the ambient temperature, the weather that day, or if I was sitting too close to it, but the prints failed repeatedly after two or three inches. The plastic would buckle, and generally with very little warning just completely delaminate with a very loud crack. It’s just a consequence of thermal cycling for a part this large. Heated cabinet… heated cabinet… heated cabinet. Need to get on that. Oh, ignore that McDonalds box. That’s a very warm spot, okay?! Once I have said heated cabinet, it’ll get even worse. What happens when you try to print skyscrapers on a machine designed to print flats. …that for some reason, the Z axis motor is not locked in one position during a layer. I’m not sure when this changed, or if it was always this way, but my Z-axis is now so incredibly smooth that it wants to fall back down the leadscrew. The problem is that my layers are so fine (0.25mm) that even a sixteenth turn of vibration-induced sliding causes the smearing of an entire layer. I’d notice horizontal stripes forming on parts which were very large in cross section (noticeable on the tailplane prints). 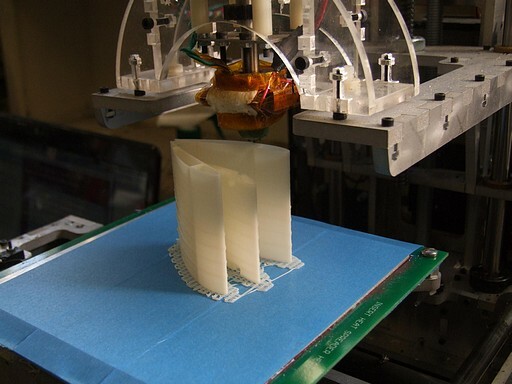 The machine loses enough layers such that the final part may be more than 1/4″ shorter than normal. 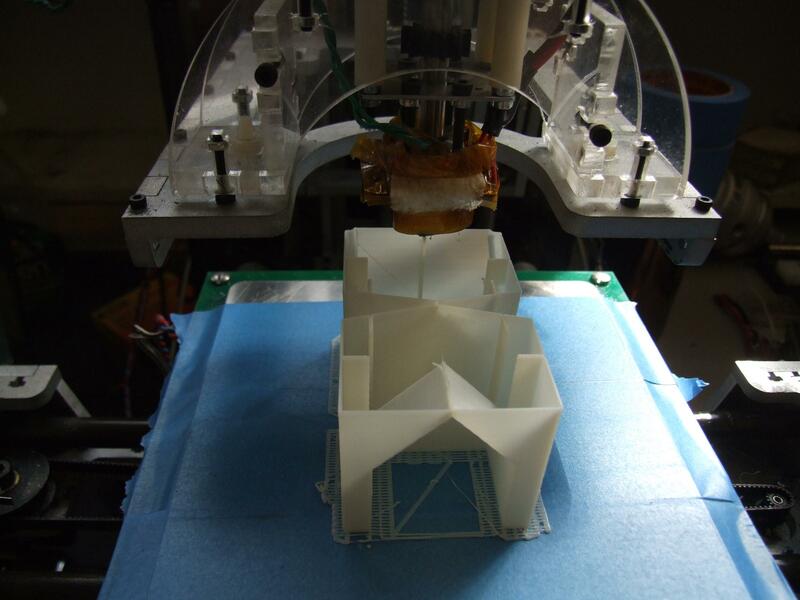 At first, I thought it was due to excessive friction on the Z axis causing the steps to fail. However, after lubing it up and noticing the problem getting worse, I concluded it had to be the opposite problem. So now I’m trying various things to increase the static friction on the leadscrew. The best solution would really be to make sure the Z motor is held with current during a layer. The most severe vibrations happen on 45 degree passes when both axes are running at roughly 3/4 speed, so I may try positioning the wings horizontally or vertically after splitting them in order to minimize time spent moving both axes near the machine’s resonance peak. How the hell did I manage to design a machine to so perfectly resonate at the exact speed I’m going to run it at? Whatever else minor project maintenance needs to happen. 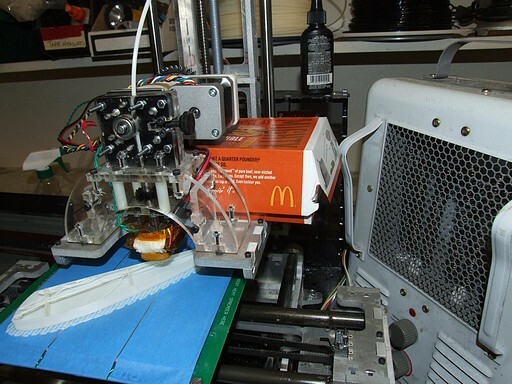 Stare endless at Make-A-Bot while it prints successive iterations of Chuckranoplan. Anyways, with the relative success of 0003, I became more or less entranced over designing the next iteration. It was going to look much the same, but feature the internal printing trickery I explored for 0003, so I’m going to not designate it 0004 for now. It also doesn’t help that I bought yet another book on these things. Maybe by the end of break I’ll actually know how they work so I can find employment building them after completely destroying this semester grade-wise! The goal for 0003B is to keep the same overall layout as 0003, but make it powered. To that end, I’ve redesigned the nose and body to hold the two 30mm ducted fan units from 0002 and provide real electronics bays. The nose is no longer a fully hollow shell, but now features a network of internal webbing that I guess is kind of like bulkheads and stringers. The Dual Integrated Bus Motor Mounts replace the dumb carbon fiber rod and hot glue mounts of 0002. The weight is still minimal, however. In ABS plastic, this part should weigh half an ounce. 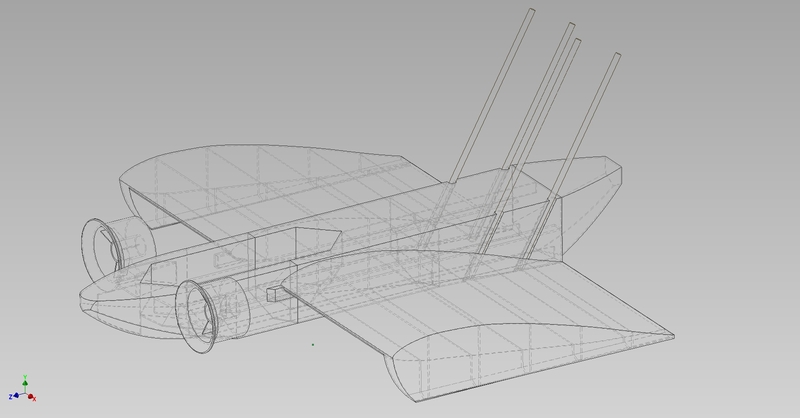 I’ve added more internal spars to the wing shell, mostly to discourage the buckling and warpage seen in 0003′s wings. 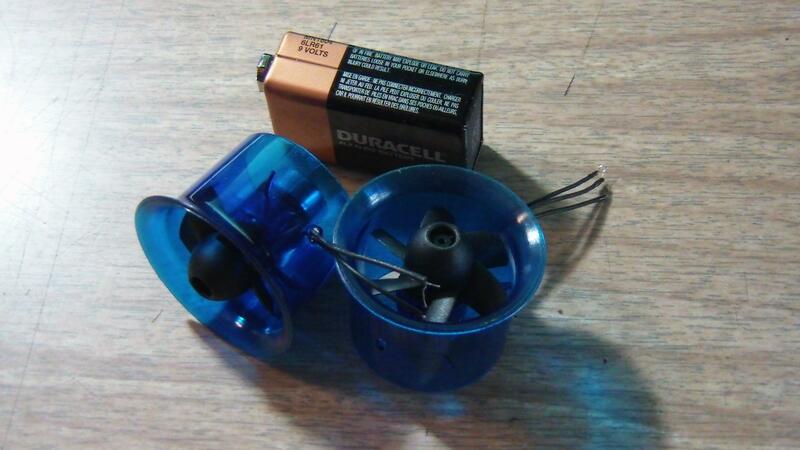 Note also the “electronics bucket” where I normally put a bubble canopy model. I’ll probably load this up with batteries and then cover the top with a strip of duct tape. 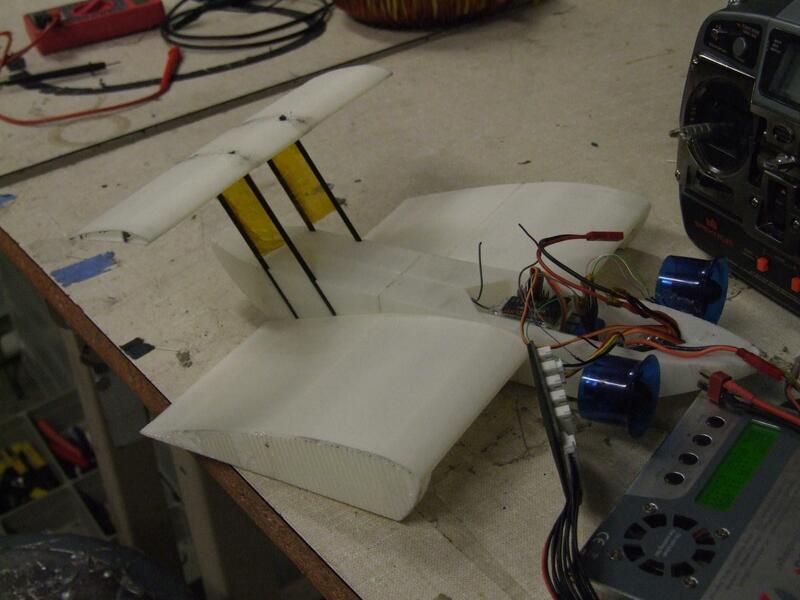 Headless but flying Chuckranoplan is better than visually appealing but dysfunctional. 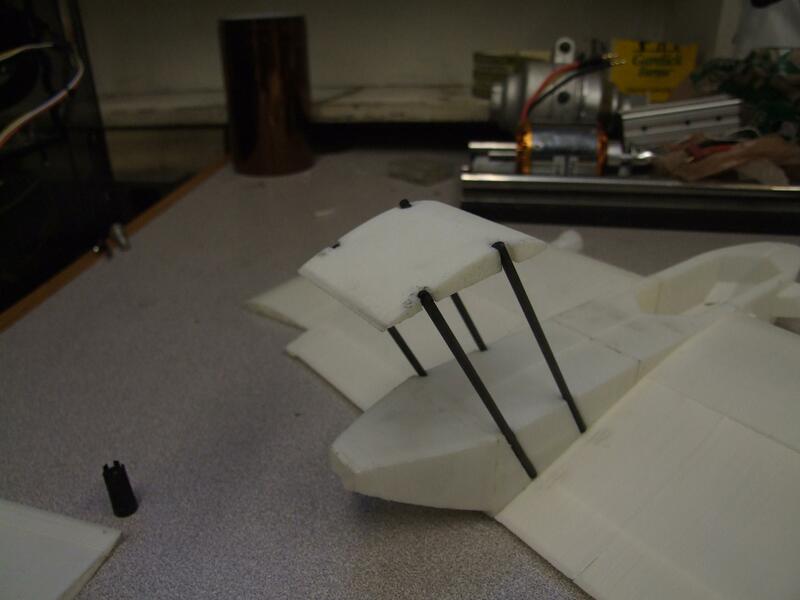 In addition, there’s one more design experiment being applied to 0003B, and that’s the attachment of the tail rods. 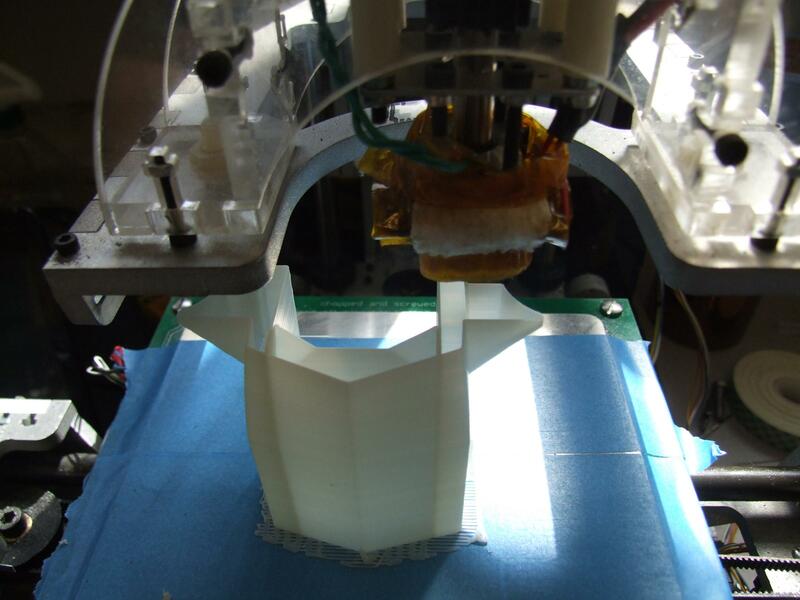 In previous iterations, I designed the rods to be inserted into printed holes in the body. However, I’ve found that MaB really can’t build a perfect hole at all, and especially not at such a steep angle from the horizontal (printing the holes with the fuselage vertical means 60+ degree overhangs, which without support material, is very difficult). 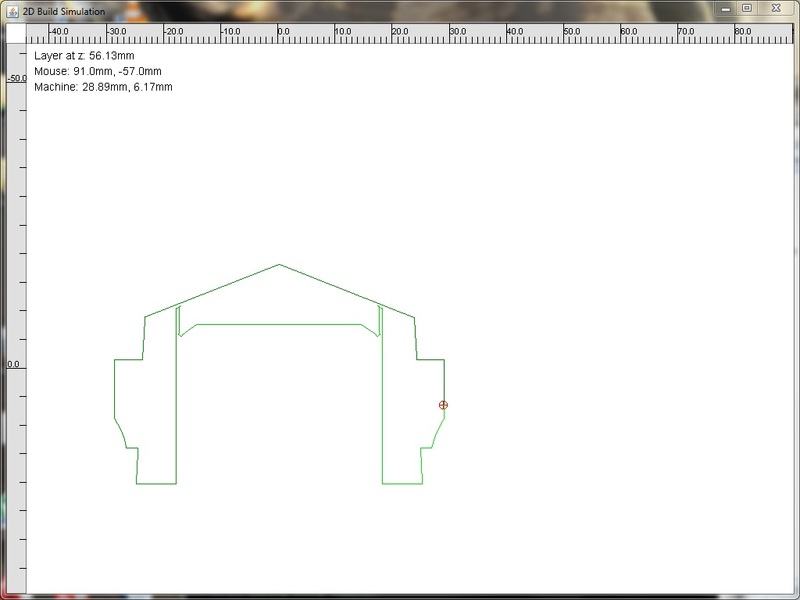 To fix this, I’ve located the rods just outside the body, sitting in angled and rounded channels. Now, the channels route as part of the outer perimeter, which means it ought to be much cleaner. The same operation was applied to the tailplane. The center part, formerly with four through-holes, now has four edge slots. The idea this time is that I can actually mount the center piece first and check the angle before closing the rods off with the end pieces. So I don’t end up with another drag chute tail. Also note the reduced amount of span members in the wings. I decided five was excessive and added weight which I needed elsewhere. You would not believe how many tries it took to get this picture, since the simulator in ReplicatorG runs at 0.8 Mach. There exist Linux hacker ways of slowing it down, but I’m not in the mood to recompile a kernel, so I just kept recapturing the screen hoping to get a complete profile. And I did, finally. 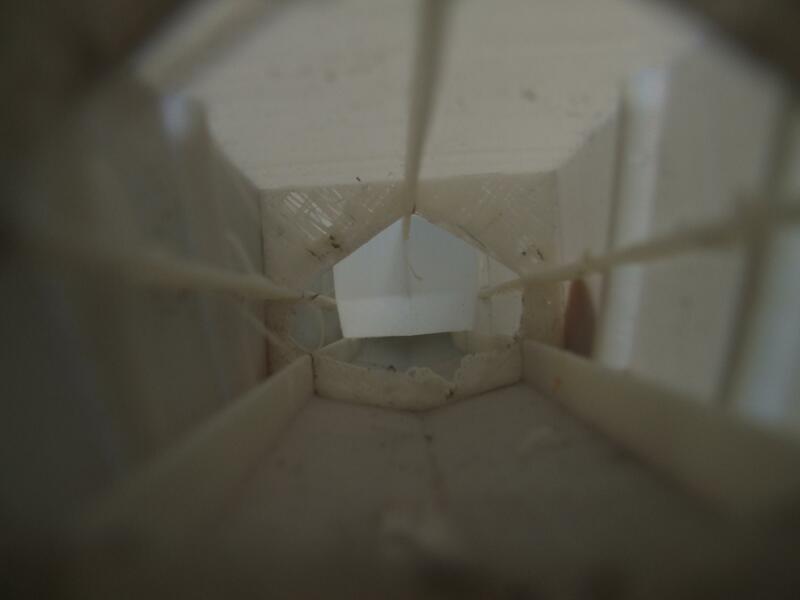 The above is a shot from a test route of the nose portion, showing the outer perimeter (just past one of the fan mounts), the internal cavity, and two underside reinforcement members being routed all as one single-wall profile. Ideally, if MaB just does this kind of thing for an hour, I won’t end up with gaps or thin spots. Theme created by miloIIIIVII | WordPress | Entries (RSS) | Comments (RSS) | 30 queries. 0.288 seconds.